In a dynamic first day of the rapid chess championship Ajedrez Villarrobledo 2009, the German grandmaster Arkadij Naiditsch snatched five consecutive wins. He is currently the sole leader of the competition with full score 5,0/5 – victories against Javier Moreno, IM Pedersen, GM Cifuentes, GM Yifan Hou, and GM Ni Hua. Half a point behind Naiditsch is GM Alexei Shirov. The Spanish number 1 player started with an early second round draw against GM Pogorelov, but later on defeated FM Kiprian Berbatrov, GM Vazquez, and GM Moiseenko to take clear second with 4,5/5. The chasing pack with 4,0/5 includes Ponomariov, Bacrot, Milov, Moiseenko, Ni Hua, Larino Nieto, Tkachiev, Milchev, Paunovic, Fridman and many more IM and GM players. Surprises were abundant in day 1. Ponomariov was held to a draw twice – by Tkachiev and Potkin. 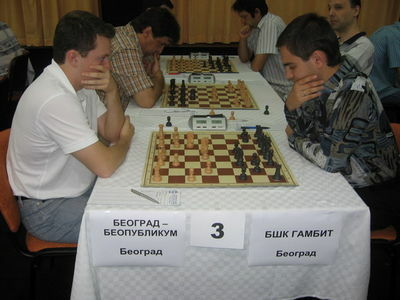 Bacrot, Grischuk, and Milov followed suit with 2 draws each, while Ljubomir Ljubojevic had polarized day winning against GM Khekin and losing to GM Fridman.